The sheets are finally dyed and waiting to become walls for the pavilion. They didn't turn out too bad. 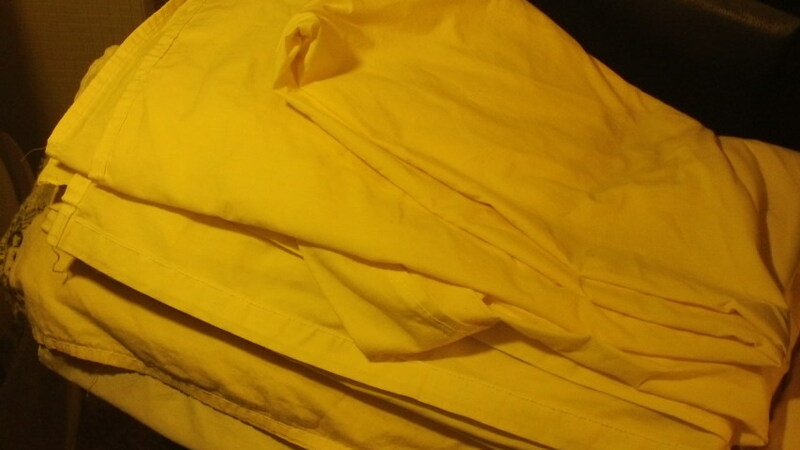 5 queen sized sheets and 4 boxes of Rit dye FTW! Next is to measure out and cut where needed. It's getting dark out now so it will have to wait until tomorrow. The walls need to be 98" square but there is the corners to go around and the sod flap at the bottom to add in. Not sure how much will be needed for the overlap where they will join at the corners. That's where waiting until tomorrow comes in. I will set up the popup and take some measurements. Then it will be onto cutting and sewing where necessary. I love these kinds of projects! 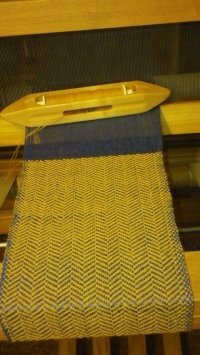 Now, back to weaving those wickelbander for Klaufi! After removing the stupid shuttle race off the beater and getting a smaller shuttle, I'm weaving faster than I ever have before. I should have these done in time for the event.